A new typhoon ‘Nalgae’ is taking shape east of the Philippines and forecast to enter the East Sea within two to three days. According to Bui Minh Tang, director of the National Hydro Meteorological Forecasting Center, Nalgae was centered 19.1 degrees north latitude and 136.4 degrees east longitude on September 28. It is slowly moving westwards in the same direction that typhoons Haitang and Nesat followed. Typhoon Nalgae is forecast to develop to level 10-12 moving at 89-117 kilometers an hour and deviating from Luzon Island of the Philippines to enter the East Sea within the next two to three days. Meantime, Nesat typhoon is headed towards the Gulf of Tonkin and expected to hit central and northern Vietnam in the next one to two days. 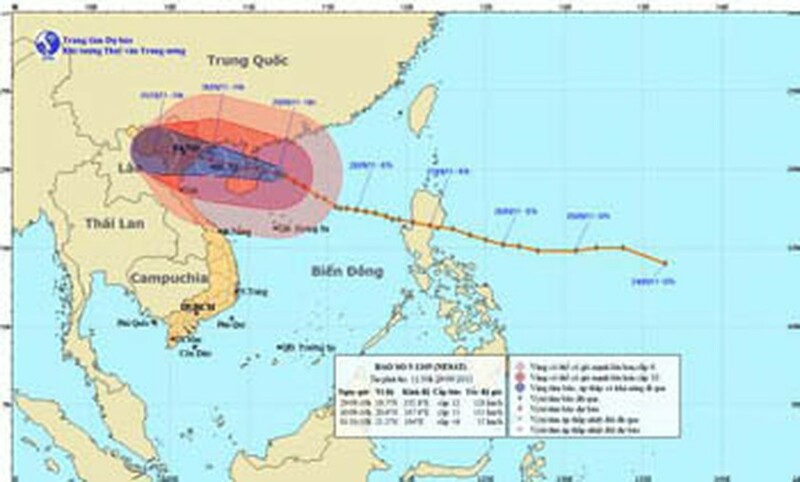 The Nesat typhoon was presently located at 19.7 degrees north latitude and 111.8 degrees east longitude, about 560 kilometers south southeast off the coasts of Quang Ninh to Nam Dinh Province by 10am on September 29. Wind gales near the eye of the storm packed at level 12-13 moving at 118-149 kilometers an hour. Within the next 24 hours, the storm will move west northwestwards at 20 kilometers an hour to be only 100 kilometers east of Quang Ninh-Nam Dinh coast by 10am on September 30. Strongest winds near its center are expected to be of level 11-12, moving at 103-133 kilometers an hour. At a meeting hosted on September 28, Deputy Prime Minister Hoang Trung Hai asked ministries and local authorities to guide all boats to shelter. They should keep a close watch on Nesat Typhoon as it is moving fast towards the Gulf of Tonkin. The storm is likely to hit the northern region and cause heavy rains over a wide area. Thus provinces in the central and southern regions should prepare for flooding, triggered by the heavy downpours.